History is written from the lives of good leaders with vision and principle, or bad leaders who led their people and countries to ruin and suffering because of their peculiar values, beliefs or ideas they felt were right and true. However, in following their ideal, something far different than they could have ever imagined or wanted came to be. When simply bad or false beliefs are carried to their logical ending, bad things follow. I will discuss the relationship between the ideology of Objectivism as defined by its creator, Ayn Rand, and the economic crash of 2008. I look closely at the steward of America’s monetary and regulatory policies, the Federal Reserve (the “Fed”). 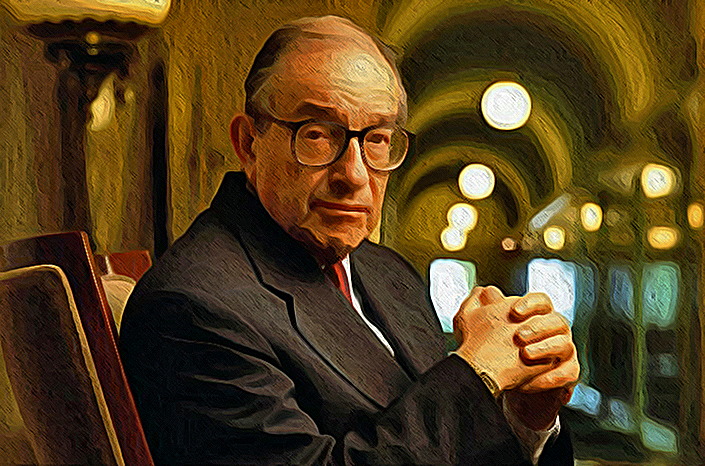 To correctly comprehend the workings of the Fed during the last two decades in large measure is to understand the beliefs of its past chairman (1987-2006), Alan Greenspan. At 18, Greenspan first read Ayn Rand’s The Fountainhead and was immediately hooked on her views of individual rights and their broader expression economically within laissez-faire capitalism. He saw this also as a moral argument against totalitarian communism. She called her views Objectivism, which championed selfishness, or as she put it, “rational self interest,” as man’s highest standard of morality. The basic principles of Objectivism are that man is an end in himself, a rational being who must use his reasoning mind to survive and properly be the judge of his values. Those values will determine his purpose. He must work for his rational self interest in achieving his own happiness, the highest moral purpose in life. It is delivered best by laissez-faire capitalism which is an economic system that recognizes individual rights, including property rights and the right of the individual in using his freedom in pursuing his own interests to achieve happiness. Government’s proper role is to protect the individual in those pursuits and minimally intrude upon those freedoms. Later at 25, Greenspan began to attend Rand’s evening gatherings. The connection was now complete and his acceptance of the ideals of Objectivism grew stronger. The Federal Reserve System was established in December 1913 after various financial panics, notably the 1907 one that shook the country and made it clear that a better way to organize our financial house had to be found. The Fed’s mandate is to control inflation, maintain price stability in the marketplace, create conditions for high employment, manage the economy and avoid the disruptive breakdowns that keep reappearing. There are 12 Federal Reserve Banks within the U.S. The President appoints the seven members of the Federal Reserve Board and the Chairman which preside over the 12 Fed banks. These seven are permanent members of the 12-member Federal Open Market Committee. The President of New York’s Federal Reserve Bank is the eighth and the other four are the presidents of other Federal Reserve Banks that attend on a rotating basis. The Chairman of the Board is the most powerful and influential position within the entire system. The Fed Chairman is the most powerful banker in the world. When Greenspan became Fed Chairman in 1987, he gained fame for his skills in dealing with many of the world’s severe economic problems. These were turbulent times that saw the savings and loan industry collapse in 1987 and the stock market crash in 1989. 1994 saw the collapse of the Mexican peso, major financial problems in Brazil and the Russian default crisis in 1996. The Asian financial crisis began in 1997. In 2000, the Internet bubble burst. As the financial collapse of 2008 approached, the giant hedge-fund, Long Term Capital Management went bankrupt. As other parts of the world suffered, America seemed an oasis of security because of the skill of this one man in guiding our economy. A quiet, intelligent economist, Greenspan is at the center of controversy when looking at our troubled economy. For nearly two decades, under Republican and Democrat administrations, he skillfully managed our nation’s economy and monetary policies. It was his persuasive leadership that determined the direction our economy would take. That policy had bipartisan support. A sense of prosperity, wealth, and economic well-being filled our country for most of his tenure, but in the end our economy nearly collapsed and underwent a recession not seen since the Great Depression. Today, our economy remains fragile and has only marginally improved with low public confidence that a lasting prosperity will return. At the depth of the Depression in 1933, Congress enacted the Glass-Steagall Act. It was apparent that the banking sector of our economy departed from the traditional business of making money from collecting deposits and making loans at reasonable interest rates, to making very risky investment loans that in the beginning were very profitable but in the end collapsed. The Depression was preceded by the Roaring Twenties, a time of great excesses. Glass-Steagall separated traditional commercial banking from investment banking and protected our nation from another Depression. It served us well for many years, but over time was compromised by the cooperation between politicians and financiers that found it a hindrance to making a profit. In 1999, the Financial Services Modernization Act that replaced Glass-Steagall, was signed into law. From that moment, the sub-prime mortgage business went into overdrive. There were now virtually no restraints on anyone in the financial sector. The rush for wealth was fast and loose. But these seemingly good times could not last and by late 2006 signs that all was not well, especially in the housing market, began appearing. In October 2008, when the economy went deep into recession, Greenspan was asked by the Congressional Oversight Committee what went wrong under his chairmanship of the Fed. His frank remarks were quite revealing: “I found a flaw in my model of how the world works and I am very distressed by that fact. I am shocked by how things turned out. I made a mistake in presuming that the self-interests of organizations, specifically banks and others, were best capable of protecting their own shareholders and their equity in the firm. I was mistaken.” Ayn Rand’s philosophy turned out to be the God that failed. Even now the fundamental flaws are being well-masked in our economic system. Nothing meaningfully has changed since 2008 when so many businesses could no longer hide their bottom line and failed in spectacular ways. The heart and mind of selfishness is a predatory condition whose first moral truth is to look out for myself first. Until a counter movement begins to make its voice heard, I believe a far greater breakdown is in store for all of us. This is not bad, just as a fever is not bad for a very sick person to regain his health. Destructive individualistic selfishness is the threat that no legislation could eliminate. It didn’t stop at the Great Depression, or the Great Recession of 2007-09. It will always find a way to serve itself at the expense of others. It will thrive in any political-economic situation. Unfortunately, it was encouraged, rewarded and ignored by lack of regulation during our seemingly prosperous times. Selfishness is an insidious disease of the spirit, with us for so long that we now think of it as normal. It is seen as a part of human nature. We accept it but hate it, unless of course it is I who benefits from my selfishness. Strangely, that is fine. Yet, we call selfishness an animal instinct. Animals are bound by their instincts, they do not have free will as we apply it to ourselves. Selfishness is a trait only of humankind. We do things knowing that the results will benefit us, usually to the disadvantage of another. Small doses of selfish acts are corrosive by themselves, but will not destroy. Yet when all restraints are gone and the greatest greed and ambitions for oneself are allowed to run rampant as they were in the great “get as rich as you can” times of the 1990s to 2006, the results speak for themselves. Wayne Hankins lives in northern California and aspires through writing to bring new meaning to the Principles that Rev. Moon taught. 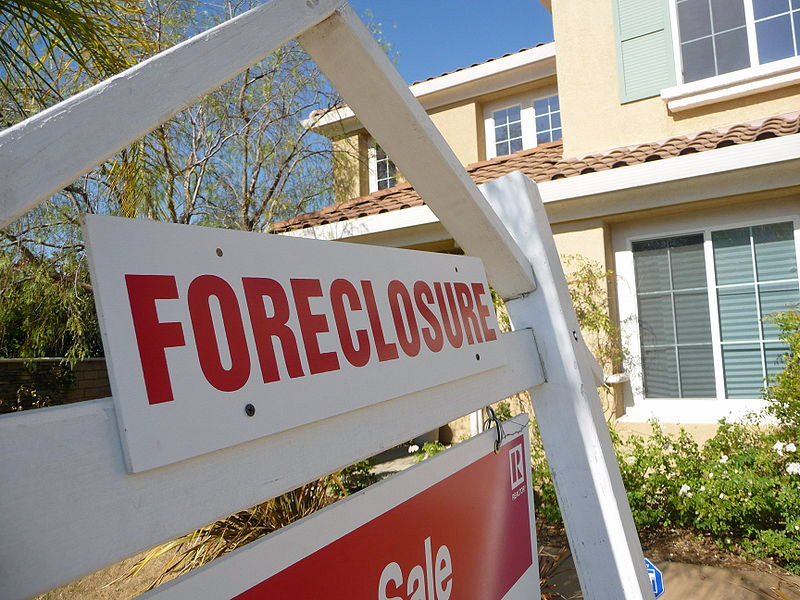 Photo of foreclosure sign (2008) by Jeff Turner. This is a very sound argument as it relates to our banking system. It was interesting to learn of Greenspan’s shock about the mistakes he had made. The undoing of the Glass-Steagall Act was indeed a tragedy that allowed bankers to depart from principled banking and engage in speculation with other people’s money. This is a clear violation of one of the three problems Rev. Moon talked about: misuse of public money. Bear in mind, this was not “government money,” but “public” in the sense that banks were responsible for stewardship of other’s money. Large banks and other financial institutions, because of their impersonal and bureaucratic nature, are incapable of such unselfishness. Like machines, they simply obey the principles of their existence. In the case of economic enterprises like banks, the goal is profit for shareholders. There is no place for stewardship or welfare in the maximization of their goals. This is why large institutions must be regulated in ways that are different from individuals. Glass-Steagall forced banks to live within the principles of sound banking, only lending money that was on deposit. Profit, in that case, could not come from speculation, but only from greater management efficiency and better lending practices. The repeal of Glass-Steagall happened under Greenspan’s watch, with a Democratic President, Bill Clinton, and with a Republican Congress led by Newt Gingrich. All three of these signed on to this unwholesome legislation, so we can’t blame just the Fed, or the Democrats, or the Republicans. All of them failed to learn from the lessons of history and bet our nation’s prosperity on mythical wishes that unregulated bureaucracies would save the economy. We saw the results of a culture that had become disconnected from sound principles. Markets are important because they lead to win-win results for producers and buyers, whereas government reallocation of goods is always win-lose. However, markets need regulation, and particularly I think we often have to see economic consolidation and size as a bad thing, rather than a good thing. A local banker will drive by a property and see how the borrower cares for the property he loaned money on. A Citi-banker in New York only has a credit score and application forms and has no proof a property even exists except for what his papers tell him. Good stewardship is impossible in that case, and large bureaucracies easily perpetuate fraud and are easily defrauded. In my view, economic consolidation has removed a sense of ownership from individuals and families and turned them into workers seeking jobs from a large system — a new type of industrial serf, rather than a foundational unit of society. Thus, when the big banks failed, we should have broken them up and spread them out among small banks rather then letting them consolidate further. Instead, we bailed out the big banks and let the small banks, who were casualties of the misdeeds of the large ones, fail. I enjoyed reading these comments and agree that Mr. Greenspan is not totally to be blamed for the economic difficulties we still find ourselves in. Phil Gramm, a Texas Republican Senator, brought the bill that once and for all ended Glass-Steagall before Congress for a vote, which was approved by a Congress itching to get out of Washington and home for Christmas and signed into law by the Democratic President, Bill Clinton. The seeming infallibility of Mr. Greenspan over several decades of running our economy and his persuasive abilities in making his case for very little regulation over free market financing is however at the heart of the problem. Selfishness is not a virtue as some believe. It is an insidious disease of the spirit when an individual allows it to grow so large that money-power-prestige become justifiable goals that supports one’s self interest. When selfishness grows without caring about the casualties that occur in its wake to accomplish its goals, is this not evil? Selfishness without a sense of the value of others is the contradiction within human nature that has led to so much of what is bad in the world. Capitalism as it now operates encourages, rewards and protects ruthless predators and good balanced stewards equally. It cannot distinguish between the two. It cannot discern degrees of greed of the participants in the system and it does not care. This may be too simplistic a conclusion but one thing I am sure of is this: The problem of self-serving individualism in the heart and mind of man is the root problem to all tragedies that we shake our heads at. It is the issue that will not be openly and fairly discussed. We brush it off with statements like, “I’m only human, I’m not perfect,” believing that stale explanation wisely says it all.